When I first featured Wansena Spearman, her shop Paper Me Jewels was in full swing on Etsy. 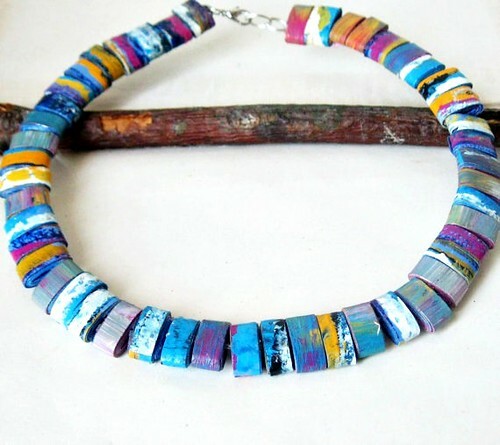 At the time she was making jewelry pieces from hand rolled paper beads. When I visited to see her latest work, I discovered Wansena has opened a new shop, Paper Memoirs [edit: site no longer available]. She has reinvented the line of necklace and earrings with a cohesive focus on first anniversary pieces. Paper still plays a leading role, but now wire, steampunk findings, old book pages, and antique-style chains define the look. 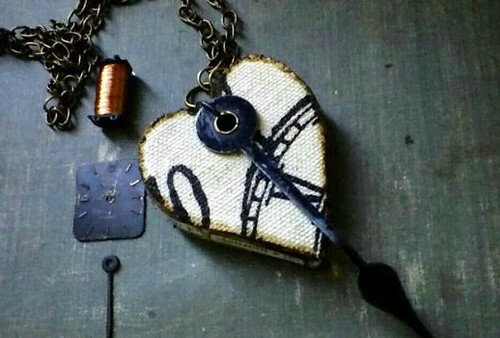 This heart necklace features decoupaged canvas, a vintage watch hand, and parts of an old book cover and pages. Wansena gave the edges an aged look with a wood burning tool. 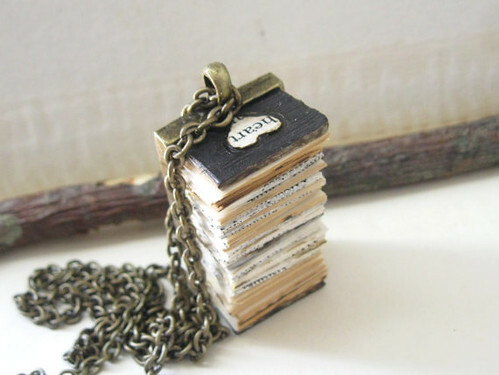 A handsome book necklace pendant features layered pages that have been encased in a bronze metal bezel. Wansena carved a rustic heart into the top and bottom covers. She often personalizes the jewelry she makes with words chosen by the purchaser. 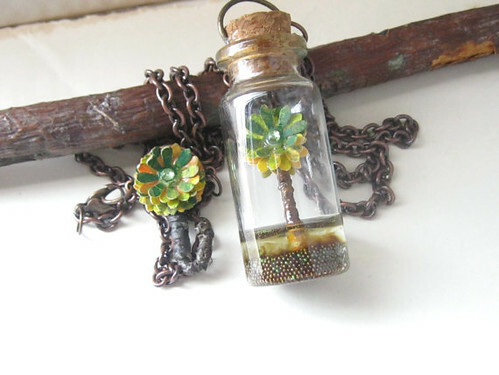 Perhaps you've noticed the popularity of glass vial jewelry around the internets. For this pendant, Wansena used acrylic gel and tiny round beads as a substrate for a paper flower that she hand painted in earthy greens and yellow. The clasp features a tiny flower too. 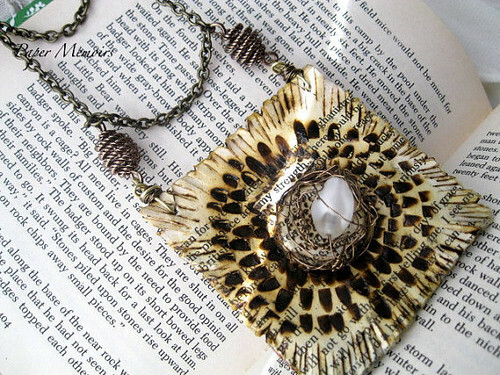 This antiqued mixed media necklace was crafted from an old book page, wire, and vintage bead with decorative burn marks. It's a handmade-to-order piece, so the wording can be customized. 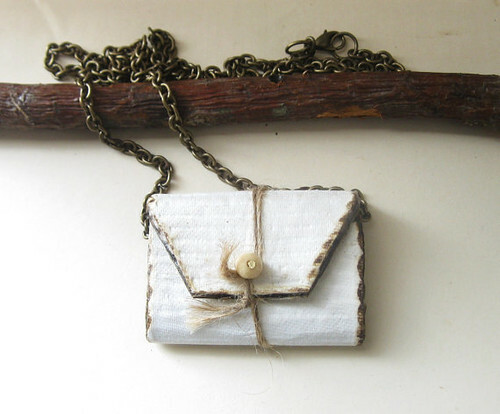 Here's an antiqued and glazed necklace that reminds me of a tiny purse. Most of the necklaces in the shop come on long chains and can be layered with other necklaces. Lastly, this tribal necklace is a nod not just to summer, but also to the paper bead jewelry you might recall from Wansena's earlier shop. Vivid shades of blue, pink, black, gold, and white have been hand painted on paper and given protective coatings of polyurethane to make the beads durable and water resistant. Pretty! Have a wonderful weekend and I hope to see you again on Monday... a new giveaway is in the works! I love her work, so inventive and unique. Vials, paper, handpainted flowers, tiny books............she's amazing ! The tiny books make me happy. So cute!! Thank You for the feature Ann. So very creative !, these are so very different(and equally brilliant) from her previous work . Love her book pendant. Wow! These are amazing! :) What a talented artist! All those pieces are so unique and beautiful. Have a great day, lovely.